Are you curious about the Academic Art of Riding? Do you have a horse in need of rehabilitation? Do you want to improve the relation between you and your horse? Do you want to find softness and happiness in the training with your horse? Then I can help you! I offer lessons in the Academic Art of Riding, work from the ground and basic handling of horses. I focus on joy, collaboration and communication between human and horse, which is created by clear pedagogy and body awareness. Even if you don’t practice Academic Art of Riding you may benefit greatly from our work from the ground, for example to vary your training or when rehabilitating your horse. Each lesson is 30 minutes and no prior knowledge is needed. 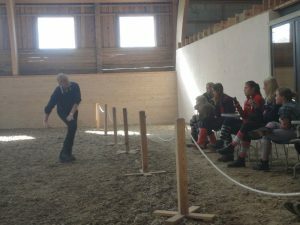 I work on the west coast, in the area around Göteborg and I drive to your stable so you and your horse can train in the comfort of your normal, familiar environment. Longer drives are also available on request if you are a group of people. For every 10 km drive the charge is 30 SEK (divided by all students). Cancellations of lessons less than 24 h prior will be fully charged.